Sean Edwards saw off allcomers last time out to extend his championship lead. After a month long hiatus, the Porsche Supercup will roll up to the pine forests of the Ardennes for round six of the 2013 championship. The high-speed Spa Francorchamps circuit will provide the Porsche 991 GT3 Cup drivers with a fearsome challenge, as they battle their way through 20 corners over the course of 4.35 miles (7.00km). A third win of the season for Sean Edwards, last time out at the Hungaroring, increased his championship lead to a healthy 16 points. The 26-year old Brit will be looking to improve on his 5th place finish in the 2012 race at the Belgian race. Spa was a happy hunting ground for Nicki Thiim last year, the Danish driver taking his first-ever Supercup victory 12 months ago. Fresh on the back of a victory in the Carrera Cup Deutschland, Thiim will be looking to make inroads into Edwards’ points lead as the season enters its final stages. Total 911’s ‘one to watch’, Ben Barker will be looking for a strong result at Spa. Total 911’s ‘one to watch’, Ben Barker will be looking to bounce back after a weekend of mixed emotions in round five. The Team Bleekemolen driver, who is third in the Rookie Cup, was running in sixth place in Hungary until he was knocked off the circuit in a collision with Jean-Karl Vernay. One thing the drivers of the premier Porsche 911 racing series will have to look out for is the notoriously fickle Belgian weather. It is not unknown for a sunny day to suddenly turn wet and, with the length of the Spa circuit, parts of the track can often remain dry, even once rain has started falling. 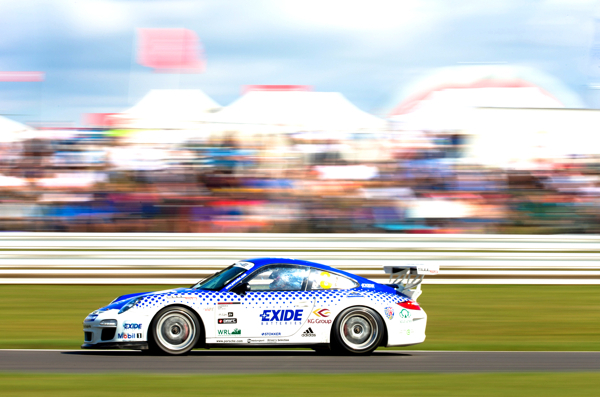 The tight and twisty Knockhill circuit, seven miles north of Dunfermline, Scotland, plays host to the 13th and 14th rounds of the Carrera Cup GB. Like Spa, the 997 GT3 Cup drivers will have to be wary of the stereotypically Celtic weather. Can Jonas Gelzinis carry his Snetterton momentum across to Scotland? After a double win in the Snetterton races, Jonas Gelzinis is the new joint championship leader. The Lithuanian racer has shown improved consistency in his 2013 campaign with six podium places on top of his trio of wins. By contrast, Meadows has not enjoyed the same consistency as his title-winning run last year. A host of mechanical problems, and mistakes means that he will be looking to reassert his authority at the head of the table. Dean Stoneman, Total 911’s national ‘one to watch’, produced a solid display at Snetterton, taking second and fourth in the races at the Norfolk circuit. However, a mid-season dip in form (after a scintillating double win in the opening rounds at Brands Hatch) has seen the 23-year old fall away from the title battle a little bit. [L-R] Rory Butcher, Jonas Gelzinis, Dean Stoneman. Despite having never raced at the Scottish circuit before, Stoneman will be hoping that he can return across the border with a strong haul of points with which to ignite a charge to the championship in this second half of the year. Rory Butcher will also be a force to be reckoned with. The Scot grew up racing Mini Coopers and Formula Ford at the Knockhill circuit. An army of supporters will also at the circuit, giving him ‘home advantage’.